Joy Mangano recently penned a new book, Inventing Joy. Photo by Bob Giglione. “When you are passionate and love what you do you keep doing more and more of it, so I just don’t stop,” says Joy Mangano speaking enthusiastically to the Press from her sprawling home in St. James. Clearly, for the inventor, designer and home shopping queen, that could not be more true. For nearly 30 years, Mangano has been living her dream by simplifying everyday challenges with smart, innovative products that make a difference to millions of people. Her breakout product was the Miracle Mop®, the first-ever self-wringing cotton mop that enabled one to wash and bleach the mop head for reuse, followed shortly by her velvety non-slip Huggable Hangers, selling more than a record-breaking billion units. The obstacles she overcame as a single mother raising three children early in her career proved so inspirational that in 2015, a Hollywood movie called Joy, based on her real-life story and starring Jennifer Lawrence, was made. Now a grandmother, she is continuously reinventing herself. During our interview, the mother of invention talked about many of her other products — My Little Steamer®; Forever Fragrant®, and Memory Cloud Pillow®, to name a few — her next product launch, and her new book, Inventing Joy, that gives readers a blueprint for success. Jennifer Lawrence, Joy Mangano and Bradley Cooper at the opening of the 2015 movie about her life. 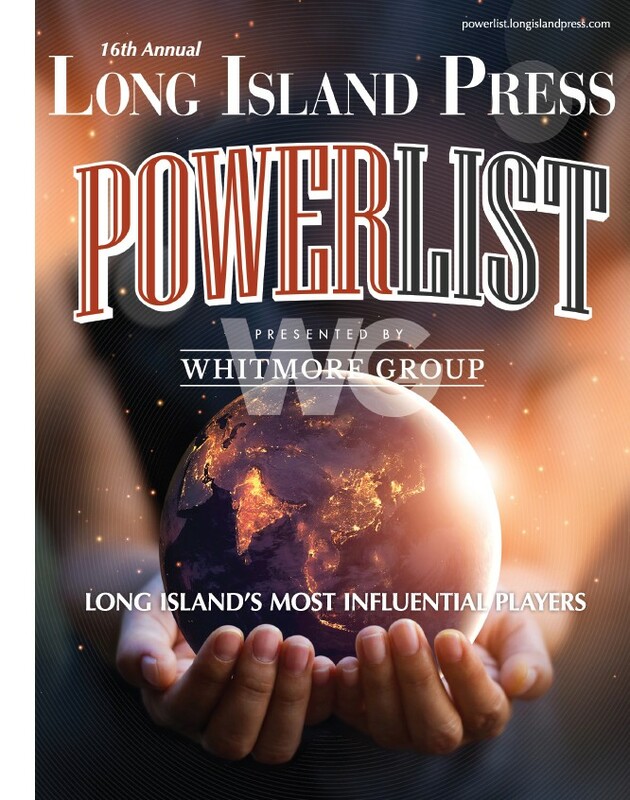 Long Island Press: How do you define success? Joy Mangano: My definition of success has nothing to do with the money. It has to do with achieving what you love to do and to set out to do a goal and complete that. I have reached success on different levels and at different times. If you keep on putting one foot in front of the other, you will have success. LIP: You overcame incredible odds to get where you are and you are a role model. What can you share? JM: The difference between myself and someone else, who may not have achieved what they wanted to, is to have the courage to keep going forward. You have to have that ability to believe in yourself. My path changed all the time drastically. Even though you have this one goal, I ended up on TV with a product, which was never my goal. I wanted to be in Kmarts across the country. I followed wherever that path went and just kept on going. LIP: Was that drive instilled in you as a child? LIP: Tell us a little bit about the early years of building your empire. JM: When I needed people to work I went to the local church. They would ride their bicycles and today they drive beautiful cars to work. I still have the manufacturing facility and offices here so everyone who worked for me can always work for me. I have had people with me for 25 years, and some of those are family. And let me tell you, when you have success, you have to look around you, because the people around you help to make that success. LIP: You could live anywhere in the world. What made you stay on Long Island? JM: I was born in Brooklyn and I grew up in the Huntington area and raised my children out here in Smithtown. 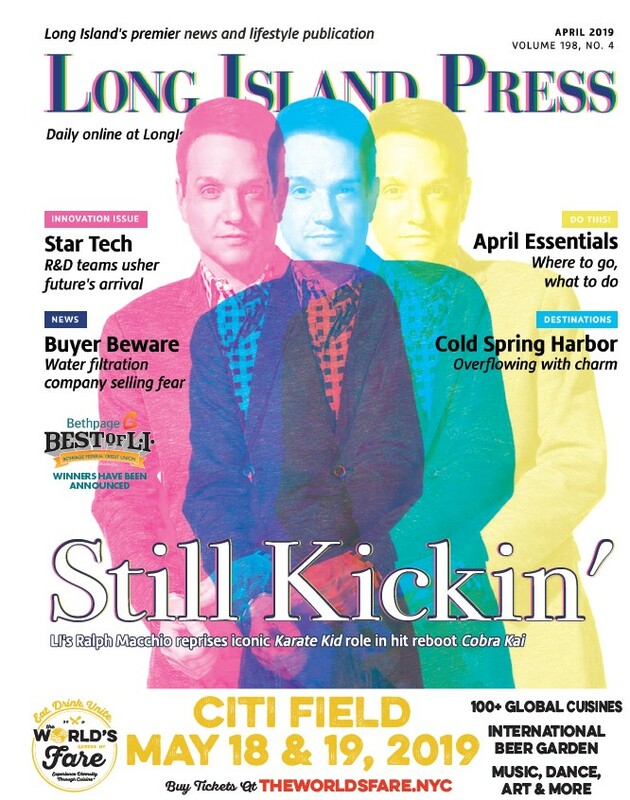 My business was built on Long Island. It is home. There were many times when it was fortuitous for me to move the business between QVC or HSN in Florida but it was always part of my deal with anybody that my business remain [on Long Island] because I will never forget where I started. LIP: Did you think the movie Joy, inspired by your life, was an accurate depiction? JM: Yes, absolutely. When David O. Russell finished filming he had a five-and-a-half hour movie because my life is such a roller coaster. It was very real, but just a part of the story. It was Hollywood. Jennifer Lawrence, Bradley Cooper, Robert DeNiro were amazing. Jennifer was brilliant. She deserved the Golden Globe Award for best actress. I’ll never forget sitting at Twentieth Century Fox studios when I saw the movie for the first time, and all the executives were around me wanting to see my reaction. It was so surreal. LIP: Did you know the film’s director before? And, was it your idea to bring the movie to Twentieth Century Fox? JM: The answers to both are no and no. I am an inventor and a product person. Years ago, I was a judge on a TV show very different from what Barry Diller started on USA Network. The producer of that show said, “One day I am going to make a movie about your life. It is so fascinating.” I got a call a few years later and he said, “Joy, I am in here with all these Hollywood producers. We are going to make a movie about your life.” Shortly after, the phone rings and it is David O. Russell. Hundreds of hours later, the movie is made. It was amazing. Interestingly enough, a very prominent producer in the theatrical world, Ken Davenport, is now making a musical, Joy, based on my life. I cannot wait to see it. LIP: What a year it has been with the #MeToo movement, with some even calling 2018 the Year of the Woman. As a powerful female, are you partial to women in industry? JM: In all honesty, I am partial to people. I love people. I love my customer. I dream about my customer when I am designing something. Twenty-five years ago, I was the only woman in so many meetings. It is always a hard road for various people for various reasons. Globally, I say you need to earn your seat at the table. Joy with her three children: (l to r.) Jacqueline, Christie and Robert Miranne. LIP: When you were raising three small children alone, how did you find your courage? JM: It was a very long road with lots of challenges but if I ever stopped you wouldn’t be sitting here talking to me today. It was during the late ’80s, early ’90s. My family was Italian. My grandmother and great grandmother came from Italy and I was raised to grow up, get married, have children, and cook and cook and cook. When I told them I was getting a divorce it was like the end of the world happened. Talk about having to have courage. I was starting a business and I was finally going to do what I have always wanted to do. LIP: It must be an incredible feeling knowing that you were there when home shopping was just starting to capture an audience. Would you say you changed the game? JM: Yes. I changed the game and I am still changing the game. I think we have made so many changes in that industry. Nothing else existed at the time. It was the early ’90s. Home shopping and buying something from the TV was very unique. LIP: Your TuffTechTM Luggage Collection sold out of nearly 30,000 sets in less than an eight-hour period when it made its debut on HSN in 2016. Tell us about that. JM: People probably don’t know I have been designing luggage for well over 10 years. That little old saying, ‘When everything gets complicated you don’t have to reinvent the wheel.’ Well, I did. I reinvented the wheel. Ninety-seven percent of luggage damage is from wheels that break. I created a wheel with SpinBallTM technology. This luggage gives you 20 percent more packing space. It is unbelievable, and the material is TuffTech TM. It is the same material they use in bulletproof vests so it doesn’t tear or rip easily. I am so proud of the luggage, as proud as I am of the Miracle Mop®. LIP: Are there any new products we should be on the lookout for? JM: I can’t say yet but it is very big. You will be able to throw out 15 things with this one thing. How does that sound? It will be out at the end of the year and let’s just say it is [based on] almost 10 years of science. LIP: Can you tell us some things that your fans may not know about you? JM: A lot of people don’t know that I introduced with Chef Ming Tsai the first ceramic nonstick technology. It changed the cooking industry, now it is everywhere. When I discover something and discover innovation I go after it. It doesn’t matter what industry. For me, it is for the consumer to have a better product, a healthier product, a safer product. LIP: So many people face hardships that can get in the way of their dreams. What would you tell them?